Hong Kong buffets are a great chance to try a table full of first-class food at a seriously reduced price. There is no better way to spend a lazy Sunday afternoon than at a Hong Kong buffet slowly making your way through the starters, mains, desserts, chocolate fountain and drinks counter. Buffets are big business in Hong Kong, and most three to five-star hotel restaurants offer a weekend spread. as do many bigger restaurants. In many ways, it's an extension of the city's Dim Sum tradition. Below we have picked five of the best Hong Kong buffets. The prices listed are for the Sunday lunch buffet, which generally runs from 12-3pm. Kids usually get a 50% reduction from these prices, while midweek and Saturday buffets will be a little bit cheaper. Prices still too expensive? There are some great buffets on a budget that will cost you under HK$200. Find out about the best cheap Hong Kong buffets for top-notch Korean BBQ and piles of waffles. To put it simply, this is the best buffet in town. The seven live cooking stations provide as much entertainment as they do great food, and can cook up just about any sort of dish you can imagine. The menu here runs from fresh sushi and rice dishes to curries and pizzas—all expertly executed. The bright and spacious interior makes Cafe Too a big hit with families and they occasionally roll out live entertainment at weekends. You’ll need to book at least a week in advance. The most elaborate buffet in town. This is where sheikhs and film stars come to down champagne, feast on seafood and melt their credit cards. The main pull is the free-flowing beer, wine and bubbly at the Sunday buffet, which also means things can get more than a little boisterous as the afternoon wears on and the magnums get emptied. The selection of food is exceptional, and the price is justified by the selection of freshly hooked lobsters, prawns and other creatures from the deep. You’ll need to book a minimum of one month in advance, if not more. No, we’re not in the employ of the Shangri La group, this is simply one of the best priced, top end buffets available. The selection is nearly as impressive as its pricier rival over on Hong Kong Island. We're talking oysters on ice and tandoori leg of leg carved on to your plate, although the selection does lean more heavily on Chinese and Asian cuisine. The crowd is a little more laid back than elsewhere and you won’t feel out of place in a sweater and jeans. Booking ahead is recommended. If you can limit yourself to just one cuisine, you’ll find the cost of your buffet is substantially reduced. Almost all of the city’s Indian restaurants will offer some spin on the buffet idea, but Jashan offers one of the best. An honorable mention in the Hong Kong Michelin guide, as well as a hatful of other awards, is confirmation that the chefs here know how to make a fantastic butter chicken. The buffet itself offers a selection of four or five curries, including a vegetarian option, plus a host of side dishes and as much naan and rice as you can eat. If you’re going to Jumbo in Aberdeen, you’re going for the experience, not the food. 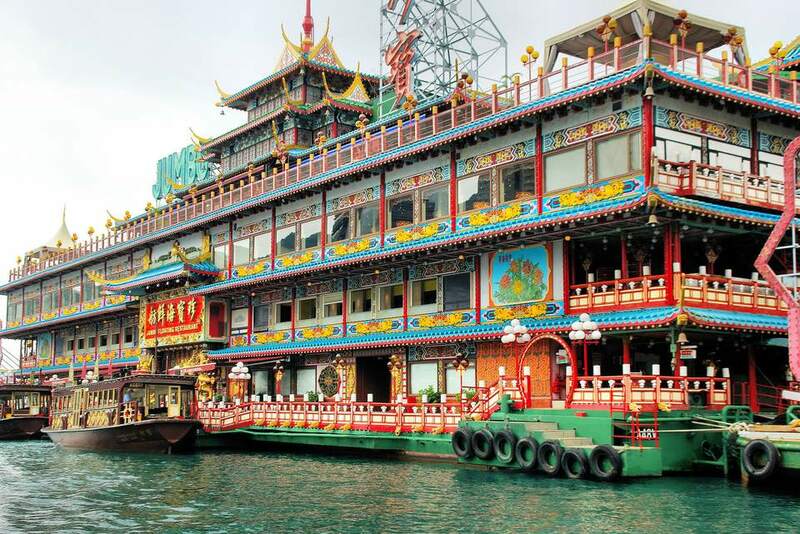 This floating restaurant set in the bay is a long-standing tourist attraction. Although the food isn't bad, you're paying for the views rather than cracking cooking. But for a one-off experience, why not? The buffet is a mixture of standard Chinese and Asian dishes, with prime place given to seafood. If the sun is shining, their top deck al fresco seating really is unbeatable.